Athens National Archaeological Museum: Exhibit 1. 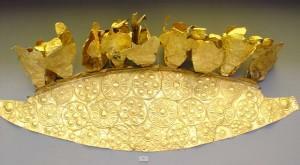 An impressive gold diadem with repoussé rosettes and thin sheets applied at the top. Arrival at Athens International Airport. Meet our representative and transfer to your hotel. The remainder of the day is at your leisure. 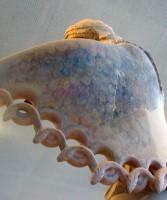 We suggest you visit the Old Part of town, Plaka, and eat at the traditional "tavernas. 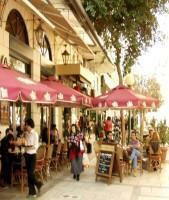 For a guideline of what you can see, please refer to our "Athens Plaka City Quarter" Photo Album starting from here. Overnight Athens. After breakfast, depart for your sightseeing tour of Athens. Visit the Tomb of the Unknown Soldier at Syntagma (Constitution) Square, the Ex Royal Palace, the Temple of Olympian Zeus, The Thesseum (Hephaestus Temple), The Greek Orthodox Cathedral, the Flea Market of Monastiraki, The Academy and, last but not least, the Acropolis and the New Acropolis Museum. Return to your hotel. Our relevant Photo Albums are entertaining and educating, and you can consult them before or after your actual tour. Overnight Athens. After breakfast, set sail on your Saronic Islands Cruise! 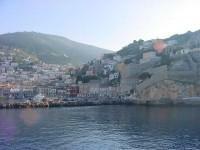 You will visit the Island of Hydra and have plenty of time at leisure to stroll, shop or swim. In the early afternoon, sail for the Island of Poros, with a short stop there. 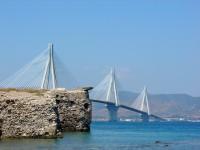 Then, passing through the narrow strait separating Poros from the Pelopennesian coast, arrive to the Island of Aegina. Lunch is served after sailing. Upon arrival to Aegina, you may join the optional excursion to the Temple of Aphaia (or Aphaea) or walk around the main town. Re-embark and sail back to Piraeus from where you will return to your hotel. Overnight Athens. After breakfast, begin your Classical Tour of Greece. We'll travel by the coastal road to the Corinth Canal, where we'll make a short stop. We'll continue to drive on and will next visit the Theater of Epidaurus, famous for its remarkable acoustics. Then we proceed to the Town of Nafplion, where we'll have a short stop, before continuing on to Mycenae to visit the Archaeological Site and the Tomb of Agamemnon. Afterward, we depart for Olympia, traveling through the Central Peloponnese and the towns of Tripolis and Megalopolis. We'll have dinner at Olympia, the Cradle of the Olympic Games, and have an overnight. In the morning we'll visit the Archaeological Site of Delphi and the local Museum, considered to be one of the four most important of the many outstanding Greek museums. Later, we depart for Kalambaka, a small town situated at the foot of the astonishing complex of Meteora, not far from its gigantic rocks. We'll have dinner here and an overnight. Today we have our long-awaited visit of Meteora, situated amid striking scenery, with the ageless monasteries perched on top of the huge rocks. Seemingly suspended between heaven and earth, and between time and space, the monsteries are the keepers of exquisite specimens of Byzantine Art. You could prepare yourself for the utterly incomprehensible natural and cultural monuments you are about to see by having a look at our Meteora Monasteries album or at our Kalambaka Town one. 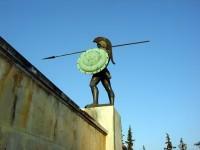 We return to Athens via Trikala, Lamia, and Thermopylae, where we stop to visit the Leonidas Monument. Our arrival in Athens will be early in the evening. Overnight Athens. Day at leisure! Enjoy your day in Athens. Visit the modern market on Ermou Street, walk through the city to see a series of "minor" ancient monuments dispersed in the city, or have a coffee and/or lunch at one of the various coffee shops/restaurants in Thission district, a new triumph of city planners over the congested city center. The area is part of a long-term plan to produce a huge archaeological park to eventually include all of the major monuments in a traffic-free environment. During the evening, you might want to have your dinner at one of the various fish tavernas in the Mikrolimano area of Piraeus. Overnight Athens. 3477. Base of a grave kouros. Marble. After your breakfast, our representative will transfer you to the Athens International Airport in plenty of time for your return flight.